We were in Huntington Beach scouting around for someplace interesting to have dinner and came across Mama’s on 39 just north of the downtown area on Beach Blvd. I’d heard of Mama’s opening a few weeks ago, but honestly thought it was closer to the beach than it’s location in a strip mall at Atlanta Ave generally only frequented by locals. Having been locals not so long ago, we actually consider the lack of tourist traffic a plus, so we dropped in a for a bite. First impressions were that Mama’s has a profoundly hipster vibe, right down to the Pabst Blue Ribbon items scattered about the menu the same way T.G.I.Friday’s pimps out Jack Daniel’s. This wasn’t a deal killer for us – I’m actually pretty amused by the hipster crowd – but it’s certainly something to take into account if that sort of thing makes you twitch. I’m going to approve of any restaurant where the waitress uniform includes knee high socks, and one of the waitresses looks like Dora from Questionable Content brought to life, so I’m voicing my bias now. But enough about atmosphere, let’s talk food. Mama’s takes its name to heart and the menu is, while relatively short, filled with the kind of comfort food you’d expect, presented on a cutesy menu with little mom-like sayings. A more hipster Johnny Reb’s, or a more Southern/affordable Hash House A Go Go, if you will. The star of such a show must, of course, be the biscuits, and they don’t disappoint. 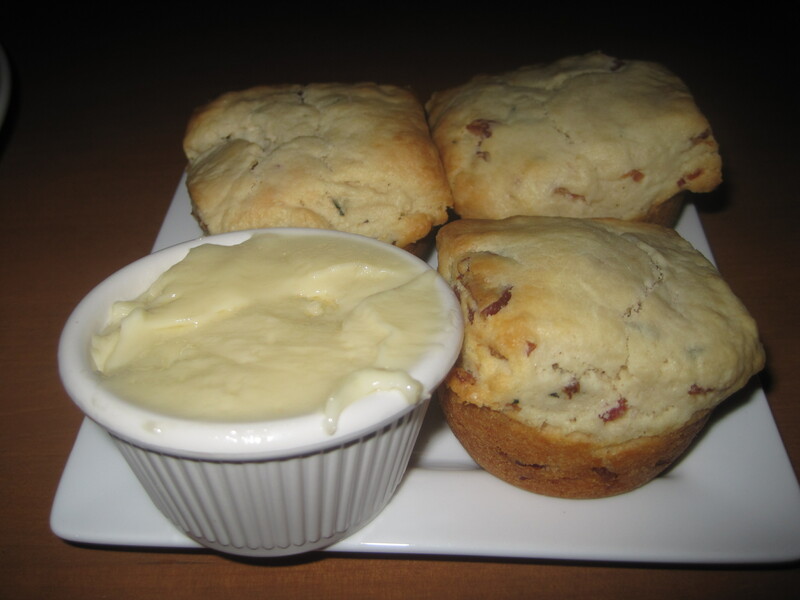 I’m not usually a fan of southern style biscuits, but these were hearty and yet fluffy, and the addition of bacon just made them better. Lucille’s has spoiled me with its free biscuits, so I’m a bit miffed at the nearly a dollar a biscuit price tag, but they blew away Lucille’s biscuits by a country mile, so you get what you pay for I guess. I wish to return to try these with gravy. Next we shared a breakfast pizza, which appears to be very similar to another breakfast pizza that was featured on Food Network a couple years ago. We never made it up to LA to try that one, so I can’t compare, but this one was quite tasty. 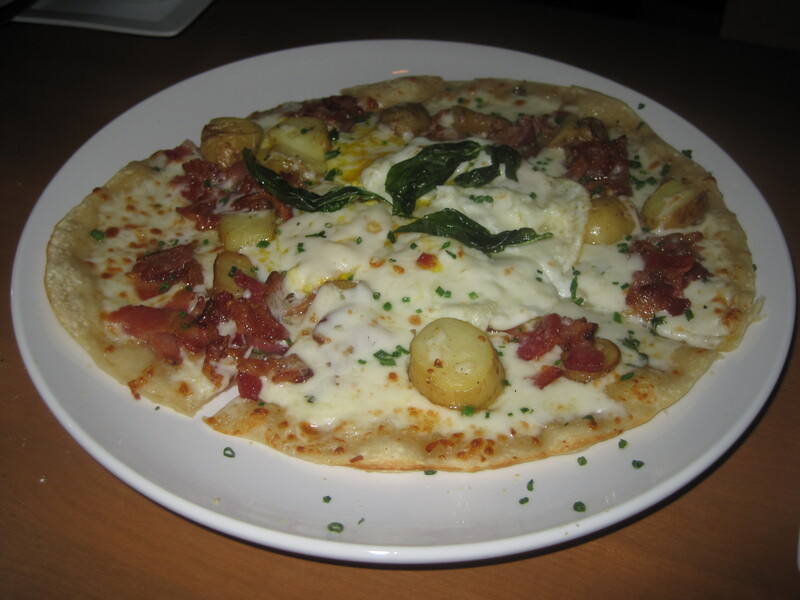 It was basically bacon, eggs, and potatoes, held down to a nice thin pizza crust with a generous serving of cheese. The slices were big and thin enough to roll up NY pizza style, giving it a taste similar to a breakfast burrito. I would highly recommend splitting this with a friend before a day at the beach. It also made me really wish there were more pizza offerings on this menu, because the cheese and pizza dough alone would make a great flatbread appetizer. 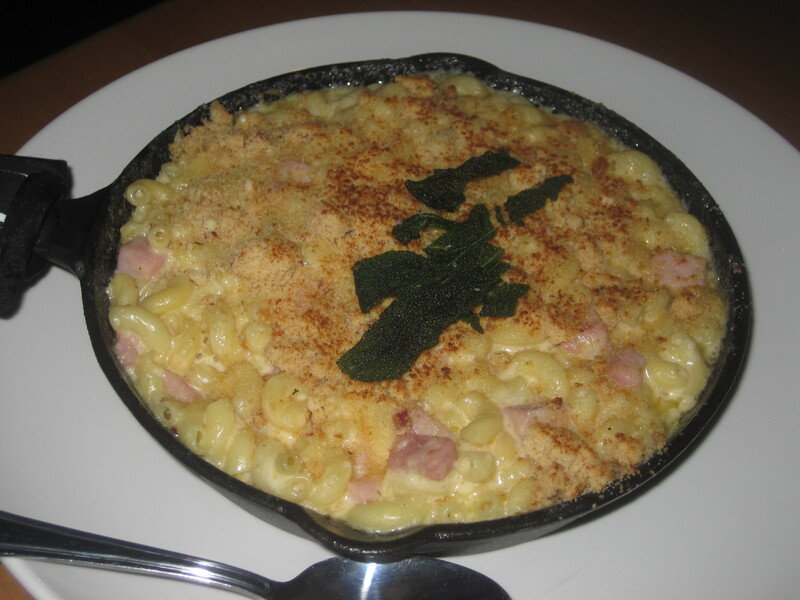 Oh, if only I had such good things to say about the mac n’ cheese from the adult menu. This dish needs work. I’m not quite sure what went wrong here, but there was way too much bite here. Someone went way to heavy handed with something sour. Maybe too much blue cheese perhaps? The menu didn’t give a list of the types of cheese involved, so it’s hard to say. But it’s easy to say we won’t be ordering this again. We didn’t even finish more than a few bites. 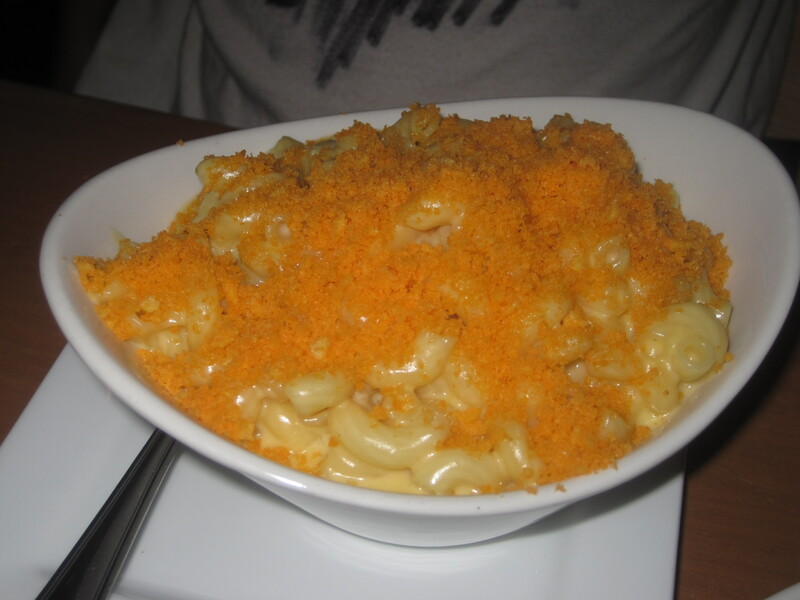 What’s confusing about that dish most is that our daughter order the kid’s mac n’ cheese, which involves a thick crust of crushed Cheetos, which was actually pretty yummy. Also, for a kid’s meal, the portion was huge. Honestly, all the portions were huge. Whatever you order, plan on sharing or taking half home for later. We’re talking Claim Jumper territory here. Personally, I’d like to see them cut down on the portion size, and cut the prices accordingly. Is there value for what you get? Sure, but I can’t always agree with my husband on what to order, and I’m not a big fan of leftovers. Really, most restaurants these days could heed that advice. I mention it here because this is the sort of restaurant I feel could benefit from some kind of “small bites” menu – there are ton of interesting ideas going on here I’d like to try, but the portions are really too large to contemplate ordering more than one entree the next time we go. So, I’d say give it a try, if at least to try the bacon biscuits. As a side note – Mama’s serves Thrifty’s Ice Cream without pretending it’s their OWN in house brand, and without the ridiculous mark up Farrell’s adds, which is kind of fun. Yeah…. x1.5 to x2 the price + x2 to x3 the portion seems to be the rubric most places are using these days. I think it’s sort of odd, but then again small dinners often end up looking like a gyp, no?